Today's card uses another retiring stamp set: Cheers To You. 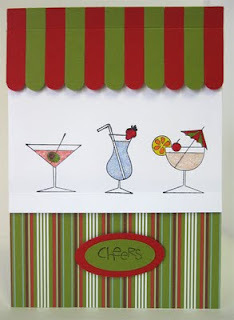 This card is called an Awning card, as at the top it has a piece that looks like a shop awning. It's made using shapes cut out with the Word Window punch, laid side by side on a backing strip of paper to hold them together. It's a bit hard to see in the photo, but the awning does stick out a bit on the card. Also, the drinks are not floating, but actually sit on a shelf that also sticks out of the card. 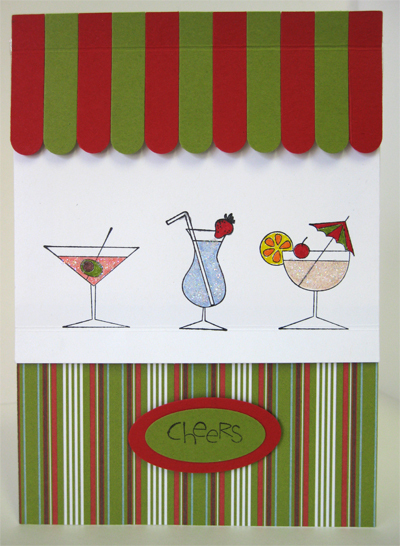 I coloured the drinks using the Stampin Write Markers, then applied a bit of glue and Dazzling Diamonds Glitter. Email me if you would like to order this set, it's only available as a wood mount set, and it costs $31.95. After August 31 it will no longer be available.